Currently, we support 16 schema types in our plugin which you can use as per your website content. Article: Adding Article schema to your blog, and article page can enhance your appearance in Google Search results with rich snippets. AudioObject: Markup your Audio content with structured data to make Google Search an entry point for discovering and listening audio. You can provide details such as the description, thumbnail URL, upload date, and time duration. Blog Posting: Adding blog Posting schema to your blog, can enhance your appearance in Google Search results. Course: Mark up your course lists with structured data so prospective students find you through Google Search. You can provide details including the course name, who are offering it, and a short description. Event: Mark up your organized events so that users can discover events through Google Search results. You can add all types of events through markup — from performances by famous artists to a neighborhood salsa class. Adding markup to your events makes it easier for users to discover and attend your event. LocalBusiness: When users search for businesses on Google Search or Maps, Search results may display a prominent Knowledge Graph card with details about a business that matched the query. When users query for a type of business, such as a restaurant, they may see a carousel of listings hosted by restaurant listing providers. NewsArticle: Adding NewsArticle schema to your blog, and article page can enhance your appearance in Google Search results. Product: Add markup to your product pages so Google can provide detailed product information in rich Search results — including Google Images. Users can see price, availability, and review ratings right on Search results. Q&A: Q&A Pages are web pages that contain data in a question and answer format, which is one question followed by its answers. For content that represents a question and its answers, you can mark up your data with the Q&A schema markup. Review: A review snippet is a short excerpt of a review or a rating from a review website, usually an average of the combined rating scores from many reviewers. When Google finds valid reviews or rating markup, we may show a rich snippet that includes stars and other summary info from reviews or ratings. Service: Services schema markup is the most specific class to define a service a business offers. Software Application: Markup software application information in the body of a web page to better display your app details in Google search results. Tech Article: Adding Tech Article schema to your blog, and article page can enhance your appearance in Google Search results. VideoObject: Markup your video content with structured data to make Google Search an entry point for discovering and watching videos. You can provide details such as the description, thumbnail URL, upload date, and duration. 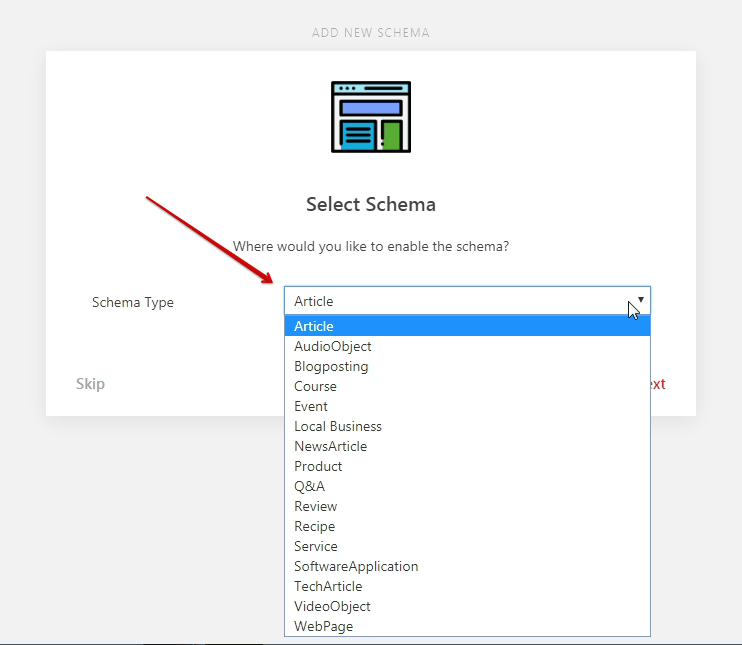 If you can’t find your preferred schema type in our plugin then you can request us we will surely implement it as soon as possible. Just contact us here and we are always available for you.